Yesterday we dug out the Christmas decor, slid holiday books into our book nook, positioned the poinsettia on the table, hung our advent tree, then flopped onto the couch. All four twins sidled next to me, and we read our first Christmas book of the season. The old favorite by Clement C. Moore, ‘Twas the Night Before Christmas. As the kids scampered off to choose their next selection, I got to thinking. 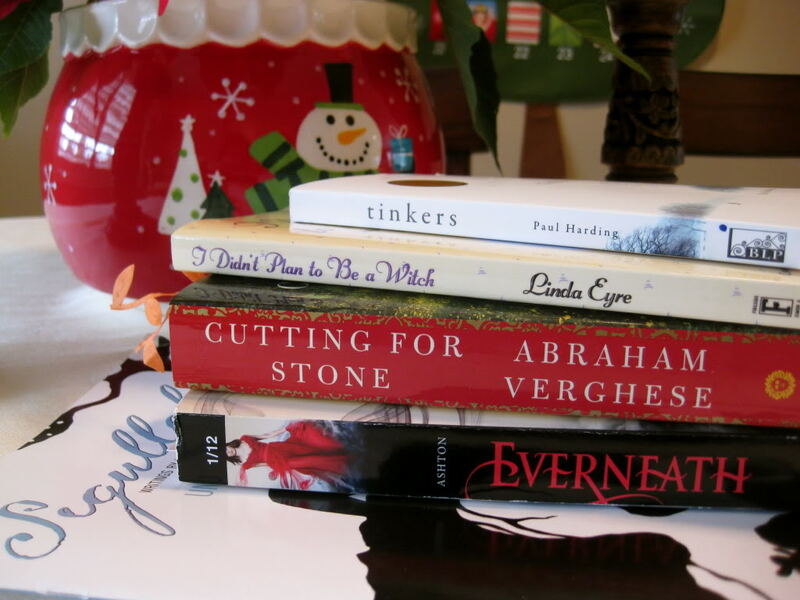 You’re probably on the hunt for books to wrap rather than pile onto your nightstand right now. Yes? Maybe I will post our favorite children’s books from 2011 before Christmas, rather than after. Thoughts? For now, here’s what I’m currently enjoying. Cutting for Stone by Abraham Verghese is a stunning novel about twin boys born in Ethiopia of a secret union to an Indian nun and a British surgeon. These twin brothers, bound by a strong connection to each other and a love for medicine, come of age as Ethiopia hovers on the brink of revolution. Verghese’s writing is excellent, and I am loving the story. But I have to warn you, his sordid details and unbridled description of medical procedures are not for the squeamish. I was whisked right back to all those hours in the cadaver lab, dissecting tissue layers, memorizing tendons and following venous pathways. But I like that kind of stuff. So I’m thoroughly enjoying the book. I’m also intrigued by the attention Verghese gives to the twin relationship. It’s a gripping story, even if a little hard to stomach. Everneath by Brodi Ashton – Brace yourself people, Everneath is going to be big. If you want to know what your teen daughters are going to be reading for the next few years, click the link and order your advance copy now. This new YA novel comes out the end of January, but since Brodi is my dear friend from childhood (we both still remember all the words and actions to an awesome rain dance we choreographed on her trampoline), she was kind enough to loan me an ARC version. I don’t start reading until 11PM most nights, but her book has kept me up until 2AM some mornings. It’s hard to put down. I don’t reach a lot of YA fiction, so it’s a change of gears for me. But I am thoroughly loving Brodi’s story. Brodi’s heroine, Nikki Beckett, has vanished into the underworld, known as the Everneath. No one knows where she has gone, then suddenly, she returns – to her old life, her family, and her boyfriend Jack. She has only six months before she is sucked back into the Everneath, so she tries to mend the relationships that matter most to her, and escape the grasp of an Everliving (immortal from the underworld) named Cole, who first enticed her to the Everneath. Pulled between two worlds, Nikki has to make the hardest decision of her life. Cheat fate and stay with Jack? Or return to the underworld as Cole’s queen. Brodi’s book is based on the greek myth of Persephone, queen of the underworld. The most interesting facet to Everneath is that Everlivings stay alive by feeding off the emotions of humans. They can draw out all the suffering a human feels, take it right from them, easing both physical and emotional pain. Tempting, right? But if you let an Everliving stay around too long, they will rob you of every emotion, even the good ones. Brodi’s book is being published by Balzer & Bray, an imprint of HarperCollins, and was picked up by Barnes and Noble for a stepladder display in January. No small deal if B&N wants your book in their front window for several weeks. Everneath will be the first of a triology you won’t want to miss. More about Brodi and her journey to getting published here. Segullah’s Fall/Winter Issue. This is our contest issue and I must say the winning essay is riveting, heart-rending, and worth a read. It’s the true story of a young mother who loses her four-year-old daughter to a sleeper wave on one of California’s northern beaches. In this piece, Brandy Tingey bares her soul about real loss. It is beautiful and hopeful, and it was a privilege to work on her piece. Also featured in this issue is artist, Cindy Ferguson, who does paper cutting. See the cover above as well as this piece below, called Squirrel Village? Pretty amazing. My girls keep stealing this issue off the kitchen counter. They love the underground worlds Ferguson has created. And I’m with them. Her work is captivating. Just a teaser for the journal. I wrote an essay about this crawly friend Eliza happened upon last August, and it will appear in our Spring/Summer issue. I Didn’t Plan to Be a Witch by Linda Eyre – This was the perfect year for me to read Linda’s book. I didn’t plan to be a witch, a maniac, a grouch, or the devil herself. But each of those demons showed up at one point or another over the last twelve months. I think I’m going to look back on this year and think, Wow. That was the year I almost lost my mind. With the age of my kids, Doug’s work schedule, and menopause. Mmm. It’s been tough. The copyright is 1988 (my mother read this book! ), but the ups and downs of mommy-hood have not changed. Linda is still speaking the right language and I value her perspective, her honesty, and her ideas. Her book has been a real comfort to me on those ugly, witchy days. (Thanks Anne Marie). Lastly, I just started Tinkers by Paul Harding. Harding is a graduate of the Iowa Writers’ Workshop and won the Pulitzer in 2010. Since I’m not far enough in to give you my own explanation, I’ll give you the one on back of the book. Do you have time to read this month? If so, what’s on your nightstand? And would you like our lists of “favorite” books before Christmas? If so, I’ll try to oblige. I love to read, but lately I haven't really found the time. My teenage daugther (who already read the novel) talked about it yesterday, and when I said, I can relate to the mother, she smiled and said: "And I can relate to the teenager." So I really hope there is a happy end to this story, ;-). I read in waves – I either read or knit – and right now I'm rereading the Harry potter series. Comfort reading! Can't wait to hear what you think when you finish Cutting For Stone-I felt the same as you about the rawness-not for the squeemish. I painfully worked my way through that book but the story will be with me forever and I'm glad I finished it. That is my favorite Eyre book! I love how you have a "book nook". What a delightful tradition you have of reading Christmas books. That Everneath sounds fascinating. You are so lucky to have an early copy! I would love to have a copy of your favorite 2011 books. I mostly read parenting/psychology books. My favorite of those lately has been "Positive Discipline for Teenagers" by Jane Nelsen. The woman has several books in her "positive discipline" series and has a lot of wisdom. As far as fiction goes, I recently stumbled upon a young adult book called "The Girl who Circumnavigated Fairyland in a Ship of Her Own Making". It's a little wierd. It reminds me of Alice in Wonderland, and my husband tells me The Phantom Tollbooth as well. So while I can't say everyone would like the eccentric nature of the story, I will say that the writing is unusually good. Her descriptions were an absolute delight to read. Knit1, Knit2 – fun re-read! Nice to escape sometimes isn't, it? I'll try to get my list up before Christmas. If not, it will be early January. Happy Holidays! Michelle – Oh I wish I could slide it your way when I'm done. The list is about five people long behind me. Can you read it in one night? 😉 Probably. Sarah – I'm glad you finished it. I'll let you know when I crease that last page. What a story! Anne Marie – Eliza's teacher asked us to bring a family holiday tradition to share with their class this month. So we're bringing our favorite popcorn treat for them to eat (I think I'll post the recipe this year – it has a tender history) while we read the kids two of our favorite christmas books. She wants the whole family to come. Fun idea, don't you think? The more I think about it, the more I think I probably won't get my favorites lists up until after Christmas. But I might do a post on our best Christmas books. I think you mentioned "The Girl who circumnavigated Fairyland… " before. What a title! Sounds very interesting. Don't you feel like there's so many good books and never enough time. I'd like to know your favorite parenting books thus far. Is there a "Positive Discipline" book for toddlers? I always want new book recommendations. I am so impressed by Brodi's book. That is awesome. Can't wait til it's in the stores at B&N and I can brag I know her. After tonight's First Presidency Christmas Devotional I am interesting in reading "The Mansion". Have you read it? Or do you own a copy? If so, will you bring it to mom's?